PSEi closed yesterday, May 21, 2015, down by .59% at 7835.38, its lowest performance in recent five days trading. 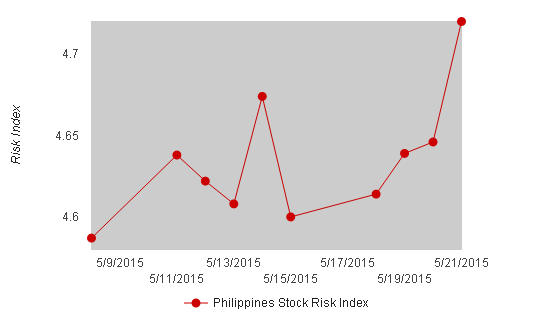 Relatively, Philippine Economist Stock Risk Index (PESRi) recorded a significant spike on stock risk from 4.646 to 4.720 up by 1.59%. The lowest risk was recorded in Telecommunications, Education, and Hotel & Leisure at 4.32, 4.33, and 4.51 respectively. The spike on stock risk is an indication of fluctuating investors’ confidence. Recent news about El Nino effect on inflation could possibly registered to investors’ mind, yet, as the rainy season approach - the El Nino effect is still to be verified. What is happening to stock market? Is it safe to invest in stock market?